Cannot create an instance of ..EntityMappingTests`1[TEntity] because Type.ContainsGenericParameters is true. According to a CodeProject article, this is the error that NUnit 2.4 threw when it encountered such tests (because generic tests were a new feature in 2.5). However, when I look at the TC process's .NET references in Process Explorer, I see that it is indeed loading NUnit 2.5.5 as I've specified in the TC configuration. So it seems to be picking up the right version. 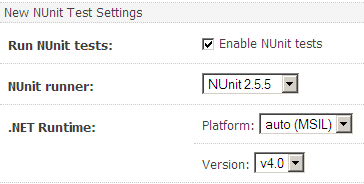 NUnit does not appear at all in my GAC. Does anyone have any idea what might be wrong here? This issue was fixed in 6.0 EAP. The fix will be available in TeamCity 5.1.3 too. Please follow the workaround from the issue. Excellent - that workaround did the trick, and I'll look forward to a new version.